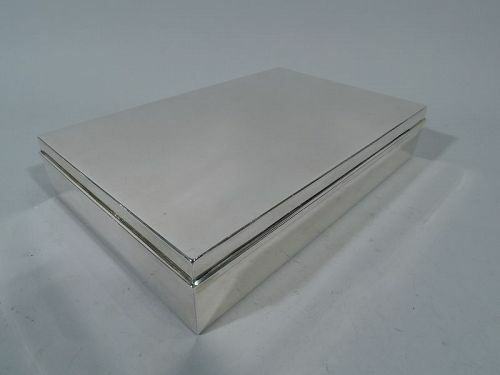 Modern sterling silver jewelry box. Made by Tiffany & Co. in New York. Long and rectangular with crisp corners. Cover is hinged with molded rim. Engraved grid that leaves plenty of room for engraving. Box and cover interior velvet lined. Hallmark includes pattern no. 22360X (first produced in 1937) and director’s letter m (1907-47). Very good condition. 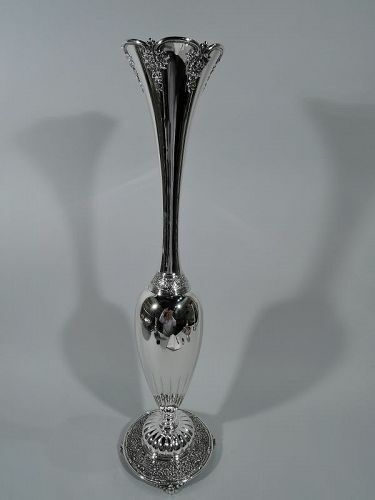 Tall and unusual sterling silver vase. Made by Tiffany & Co. in New York. Attenuated oval body with soft fluting on lobed and domed foot mounted to circular base with 4 foliate-shell supports. Neck and mouth conical with scalloped rim and applied pendant flowers. Dense tooled bands with scrolls and flowers at neck base and base. Gilt interior. Hallmark includes pattern no. 12493 (first produced in 1895) and director’s letter T (1892-1902). Excellent condition. 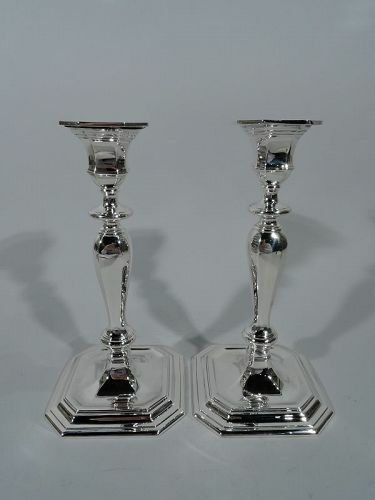 Pair of Georgian sterling silver candlesticks. Made by Tiffany & Co. in New York, ca 1913. Each: Faceted and knopped baluster shaft on stepped and chamfered square base. Faceted urn socket with flat and chamfered detachable bobeche. Olden-days form spiffed up for the Modern twentieth century. Hallmark includes pattern no. 18506 (first produced in 1913) and director’s letter m (1907-47). Very good condition. 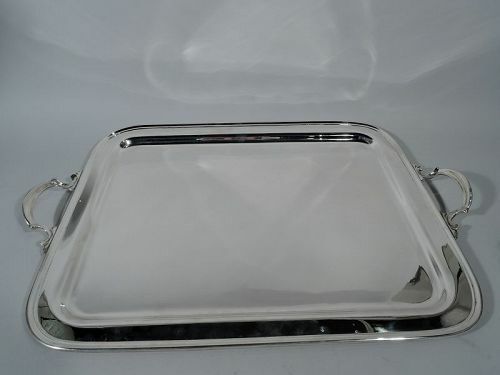 Art Deco sterling silver vanity set. Made by Tiffany & Co. in New York. 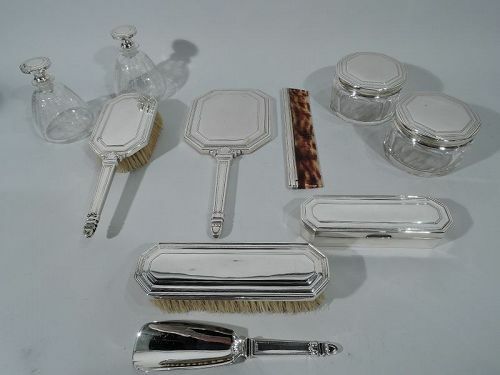 This set comprises 10 pieces: hand mirror, hairbrush, comb, clothing brush, shoe horn, box, 2 perfume bottles, and 2 powder jars. Rectilinear and chamfered forms with raised central panel and fine dentil borders. Handles have stylized acanthus motif. Bottles conical with acid-etched pendant flowers in rectilinear frames. Jars round and faceted. Restrained classical modernism. 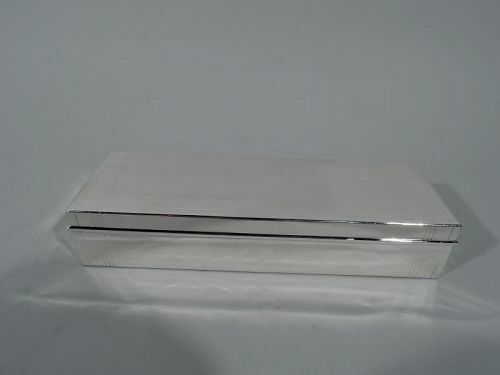 Large and classic sterling silver box. Made by Tiffany & Co. in New York. Rectangular with straight sides. Cover flat and hinged with molded rim. Box interior cedar lined and partitioned. Postwar hallmark includes pattern no. 22358. Very good condition with crisp corners. 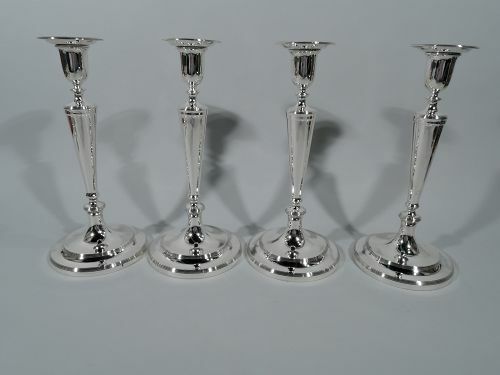 Four Edwardian Classical sterling silver candlesticks. Made by Tiffany & Co. in New York. Urn socket with detachable bobeche, tapering columnar shaft, knops, and stepped foot. Spare form embellished with reeding. An elegant set that works on both traditional and modern tables. Hallmarks include pattern no. 17267B (first produced in 1908) and order no. 3478. Excellent condition. 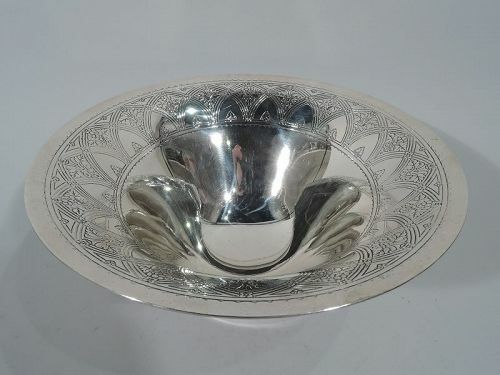 Art Deco sterling silver centerpiece bowl. Made by Tiffany & Co. in New York, ca 1924. Wide mouth, steeply tapering sides, and stepped foot. Interior has acid-etched interlaced arcade inset with flowers and scalloped border. A semi-abstract design that draws on Victorian prototypes. Hallmark includes pattern no. 20448A (first produced in 1924) and director’s letter m (1907-47). Very good condition. 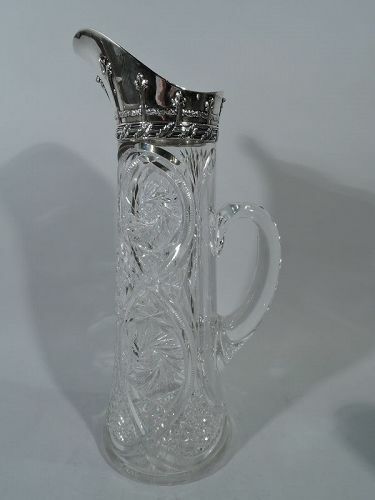 Gilded Age brilliant-cut glass claret jug with sterling silver collar. Made by Tiffany & Co. in New York. Tall and upward tapering with c-scroll handle. Stars, diaper, flowers, and ferns set in interlaced scrolled frame. Collar has helmet mouth with applied garland and pilaster-style tendrils. Base reeded with applied leaves. A gorgeous piece whose clear color shows off the rich hue of the booze. Hallmark includes director’s letter C (1902-7). Very good condition. 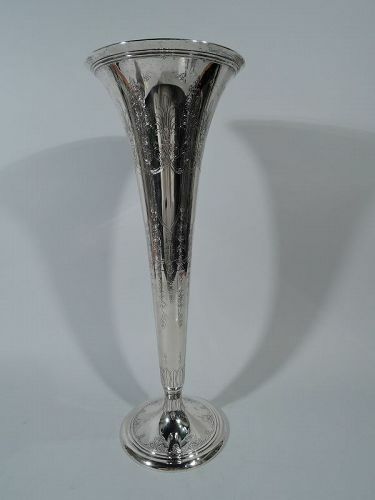 Tall Art Deco sterling silver trumpet vase. Made by Tiffany & Co. in New York, ca 1913. Traditional form on stepped and raised foot. Acid-etched vertical and stylized ornament: Armorial frames (vacant) with crowns and garlands in form of paterae, leaves, and flowers. Hallmark includes no. 18577A (first produced in 1913) and director’s letter m (1907-47). Very good condition. 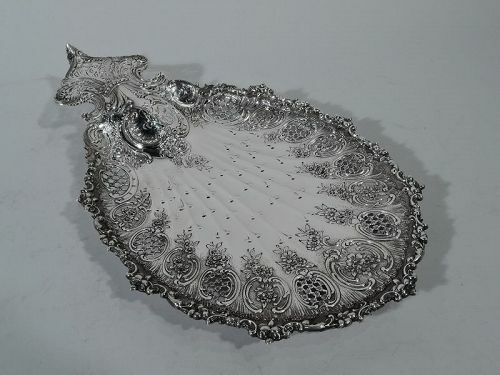 Edwardian sterling silver Mother Goose porringer. Made by Tiffany & Co. in New York. Bowl has straight sides with open tree handle. Acid-etched on exterior in pictures and text is Little Tom Tucker. In one frame: Bow-wow-wow! Whose dog are though? In other: Little Tom Tucker’s dog, bow-wow-wow! 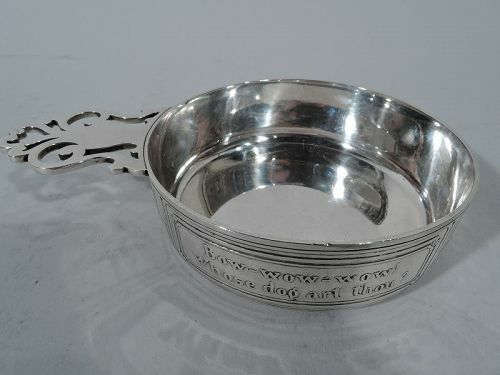 Scrolled frame vacant for engraving whose porringer this is. Hallmark includes pattern no. 57961 and director’s letter m (1907-47). Very good condition.